We had planned on hiking a loop around Kintla Lake and Bowman Lake with the chance to see the famous Hole in the Wall in the middle of our trip. Unfortunately, we didn’t manage to get the permits we wanted, but we ended up with permits for some other cool campsites around Bowman Lake and Lower Quartz Lake with the opportunity to do a day hike up towards Hole in the Wall (although we never actually made it that far). After some coffee and delicious huckleberry bear paws from the Polebridge Mercantile (seriously, the bakery there is legendary! ), we started on the trail. The first day, we hiked just three miles straight over a ridge to Lower Quartz Lake for a day of fishing and hanging out. It had been raining the night before so everything was wet and smelled sort of musty. However, there was an abundance of huckleberries along the trail, so we took our leisurely time picking berries and eating them. There were also thimbleberries, which taste a whole lot like fruit leather and there were wild raspberries, which were small, but delicious. Our mileage each day wasn’t very long and we weren’t pushing ourselves to the limit by any stretch of the imagination. However, our packs were heavy and the hills were steep. We decided to pack yummy, healthy food like avocadoes and salami and cheese rather than light food, such as those fancy dehydrated backpacker meals. Each day, my friends and I woke up around 9am and took our time filtering water, making coffee and breakfast, and getting camp all packed up. A giardia outbreak in West Glacier meant we had to be extra careful about filtering ALL of our water. We decided not to rush things or to stress out too much about time. I had a watch, but we only used it to figure out when to eat and when to have our camp set up in the evening. We had to make sure to be extra careful about hanging our food and other smelly things, like toothpaste and tiger balm and lotion. The bears in glacier are extremely abundant, and the rangers warned us that they would have no problem trying to move our tents to get at food if there was anything fragrant around the campsite. Glacier National Park is famous for its wildlife. 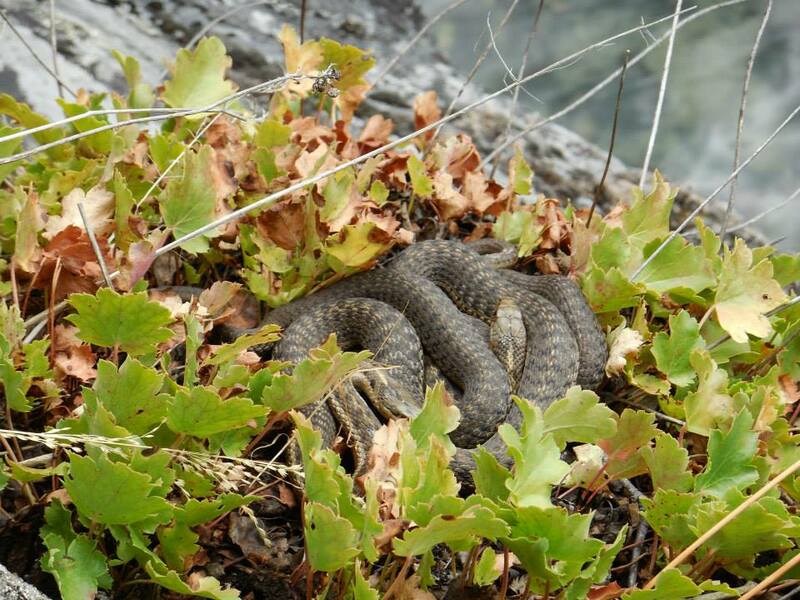 We witnessed snakes curled up on rocks in the sun. We startled some toads (maybe they were bullfrogs?) that were larger than our hands. We caught chipmunks and small squirrels trying to steal our food at meal times. We stumbled on many bear tracks in the trail. My friend Jackson showed us that if you can see claw marks in a print, it’s probably a grizzly; otherwise it’s most likely a black bear. As much as I wanted to see a bear in the park, I have to admit that it’s probably better that we didn’t. We were prepared with the obligatory bear spray, though, just in case. Grizzly attacks are not unheard of, and one of the main reasons people glimpse bears is because of bad habits in back country camps, such as leaving food out. In the lakes, the fish were everywhere. There were several different kinds of trout, including the lake trout, which are an invasive species in the park. While we were allowed (and even encouraged) to catch and eat the lake trout, visitors are strictly forbidden from retaining bull trout if they are accidentally caught and there’s a catch and release policy for cutthroat trout caught west of the continental divide. Of course, for those of us who don’t know one trout from another, this means that we’d have to release every fish we caught, but for my friends who live in Montana and fly-fish on a regular basis, these rules meant a lot and they were able to correctly (I think!) identify all of the fish they caught. On the lakes, there were also tons of birds. Every morning we were awakened by the loons yodeling and hooting and wailing. On top of mammals, amphibians, reptiles, fish, and birds, we saw bugs galore. One day a flock of butterflies came out of nowhere and landed all over everything. They were orange on the top of their wings, but when they folded up, they looked exactly like lichen. They landed on our packs and on our legs and flew around our shoes and other possessions. It looked as though they were attracted to our sweat and it was pretty amazing to see them everywhere. Spending four days backpacking gave me a lot to think about and reflect on. When you’re out in the woods, it’s the little details that occupy your mind. Sure, I thought about what was going on at home and in the world, but when my friends and I talked, it would generally be about what was going on around us. We had long conversations about plant and animal identifications. We talked about why the mountains look like they do. We talked about the glaciers that formed the landscape in the park and about the bear paw prints we saw on the path. We discussed conservation. We hardly ever talked about school or work or finances – the things that tend to occupy and run our lives as home. We really just experienced where we were and what we were doing. As Joseph Wood Krutch put it when referring to the outdoors, “We have not merely escaped from something but also into something.” I realized that THIS is one of the main reasons why I love backpacking. My friend Kia put it perfectly, “Backpacking is like hitting a reset button on life.” There’s no email in the woods. No cell service. No Netflix. If something happens at home, there is no way for you to know about it, so there’s no point in worrying! In the woods, you get to clear your mind of all of the things that are plaguing your life. Relationship problems suddenly don’t matter. Debts don’t seem like a big deal. If you’re a few days late responding to an email, it’s not a problem. Getting your water filtered, hanging your food, and trying to get a fire started with damp wood are your biggest daily challenges. By the end of the four days, we were pretty ready to be back in civilization. All of us wanted real food that was cooked on an actual stove with actual spices and a bed that we could curl up in without our backs hurting. We wanted toilets that flushed and water from the tap. We were ready to start answering texts and emails and going to work and school. In fact, all of these things sounded kind of nice. Our attitudes and our brains and our bodies had been reset. Backpacking is like a whole other life. We hurt our backs carrying 50-pound packs, slept on the hard ground, skipped showers, and peed in the woods. We got eaten alive by mosquitoes and spent huge amounts of time straining our arms while pumping our water filter to make drinkable water. For some reason, we gave up all of the comforts of the city in order to enjoy the stunning views and total quiet of the backcountry. I believe it’s for that reset button. I believe it’s for that feeling of escaping “into something.” Now that I’m back in my daily life, sitting in front of a computer, I don’t necessarily know more or have a different perspective, but it feels like I just remembered why I’m doing what I do. All that thinking and focusing on other things for a few days brought me back into myself and helped to rekindle my passion for the work I’m doing and the subjects I’m studying. Getting a dosage of that “tonic of wildness” really can do wonders.